Clean, rinse out a full chicken. Pat it dry inside and out. Slice 2 tbsp butter into thin strips and melt the remaining 2 tbsp butter. Keep both aside. Mix the kosher salt and freshly ground pepper. Peel and cut the potatoes and carrots into thick wedges. Slice the onion into chunks and cut the garlic bulb and the lemon into half. Place the potatoes and carrots in a deep roasting pan. Salt it well. Place a rack over these vegetables. Using your fingers,rub the kosher salt & pepper mixture under the skin of the chicken. Then insert the thin strips of butter under the skin of the chicken breast and leg. Rub the salt and pepper mixture inside the cavity of the chicken. Once done stuff it with the onions,garlic and the lemon. Brush the melted butter all over the chicken, and then rub it all over with the salt mixture. Tuck the wing tips behind the neck and using a twine tie both legs together. 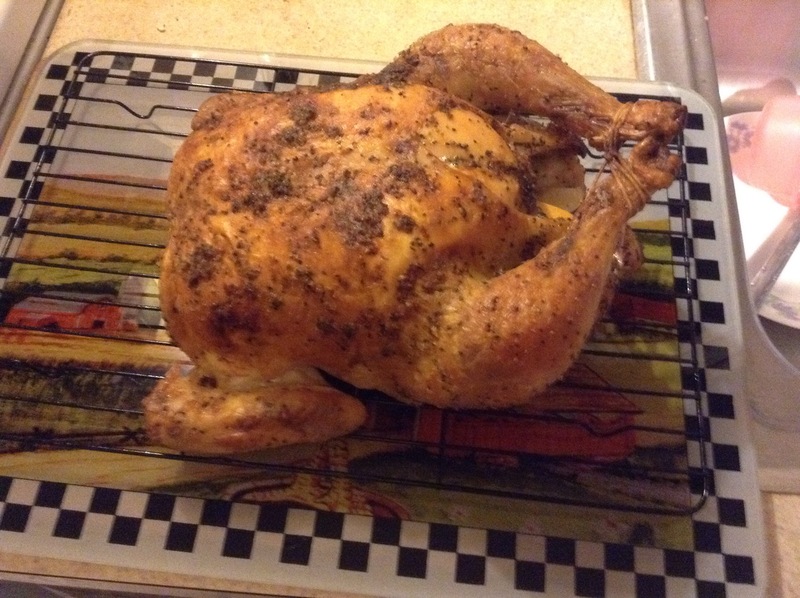 Place the chicken on the roasting pan rack and put it into the oven for approximately 2 hours. Half way through, brush some more melted butter on the chicken, so that the skin gets to be crispy! To check it is done, the internal temperature should be about 165 F, and the juices should run clear when pierced at the juncture of the thigh. Serve with the roasted vegetables and hot rolls. This entry was posted in Butter, Carrots, Chicken, Garlic, Kosher salt, onions, Pepper, Potatoes and tagged butter, carrots, Chicken, garlic, onion, Potatoes. Bookmark the permalink. Very interesting Preeti will try it out. However, I have always found that the chicken kept for more than an hour becomes very dry. I guess it depends on the size of the chicken? ?